Posted on Wednesday, September 20th, 2017 at 7:10 pm. “Sports” is not what usually comes to mind first when people think about Taiwan, but in August, thousands of student athletes landed in Taiwan to compete in the 2017 Summer Universiade, hosted in Taipei and the surrounding municipalities. Taiwan ranked 3rd at the competition with 90 medals, including 26 gold medals! 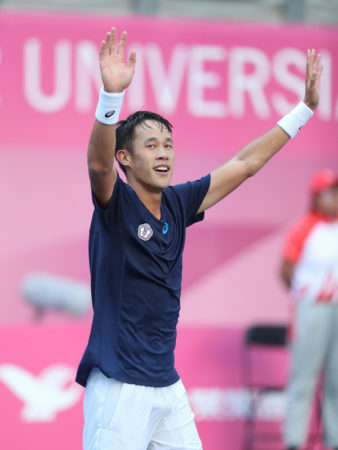 TaiwaneseAmerican.org’s Eric Kao chatted with Taiwanese American tennis player Jason Jung who competed for Taiwan at the Universiade and did quite well for himself. Read on! Eric: Hi Jason, thanks for taking the time to answer some questions so our readers can get to know you a little bit better! For those who may not know, you recently represented Taiwan in the 2017 Summer Universiade (held in Taipei!) and won the gold medal in Men’s Singles for tennis. Jason, congrats! Could you tell us a little bit about Universiade and what it was like competing in it? Jason: Thank you! It has definitely been a crazy last few weeks since the Universiade Games. Life changing experience for me. The Universiade Games was a small version of the Olympics and for me to represent Taiwan and Taiwan being the host country was an unbelievable opportunity for me. Competing at the Games was amazing. Every match I played the stadium was almost filled. I have never seen Taiwan so united. It was really amazing to see and experience. E: That’s great! I personally felt really proud to not only see Taiwan compete against other nations but to see Taiwan as the host of the competition. What kind of impact do you think this had in terms of Taiwanese pride and recognition on the world stage? J: I was definitely amazed to see the Taiwanese people come together for the Universiade Games. For those who don’t know, during international sporting competitions Taiwan is not known as Taiwan. We are known as, Chinese Taipei, and there’s also a different flag. So for me, to see so many Taiwan flags in the crowd and see Taiwanese people come together for the Games was truly inspiring. E: So let’s go back a few years to the beginnings of Jason Jung, the tennis player. When did you start playing tennis, and what was the path to where you are today? E: Sounds like it wasn’t a straight path, but it worked out! 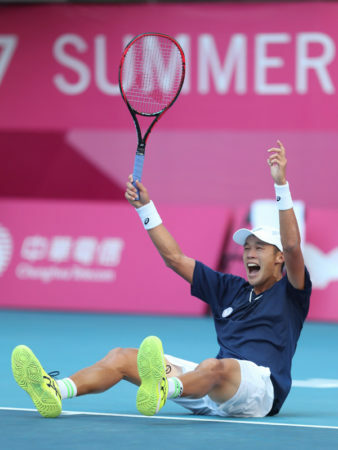 Although you were born in the US, you represented Taiwan in the Universiade and represent Taiwan on the ATP World Tour (currently ranked in the top 250!). What made you decide to play for Taiwan rather than the US? J: I had the opportunity a few years ago to represent Taiwan in tennis. I jumped at the opportunity because I’ve always had a strong Taiwanese identity. Tennis in Taiwan is not comparable to the US, as there are so many more players in the US. I’ve always wanted to help Taiwan in any way I could and using tennis was a great way. E: We saw that Dr. Yuan T. Lee, a Taiwanese American Nobel Prize winner for Chemistry, came to support you at the competition. Any connection there? J: We have close mutual friends. Dr. Lee is a big fan of tennis and he actually did the coin toss for my semifinal and finals match. He told me he came back to do the coin toss for the finals because he thought it was his good luck flip! E: Sounds like it was good luck! What was kind of cool was seeing in some interviews that you responded to questions in Taiwanese – how did you learn to speak Taiwanese? J: Quite interesting right?? 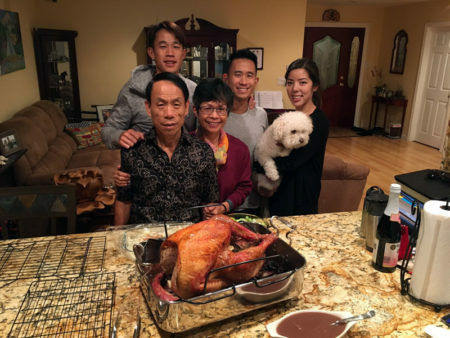 Growing up at home in California, Taiwanese and English were the only languages I spoke with my parents. My father wanted to keep the Taiwanese identity in my brother and me. Although I did study Chinese in college, my Taiwanese is still better. E: Speaking of family, How does your family play a role in your career? 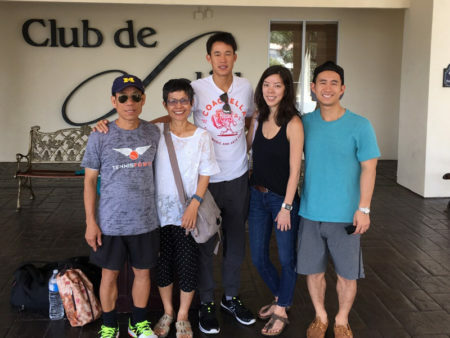 J: My family has always been very supportive of my tennis career. It hasn’t been an easy road, but they have supported me since the beginning. E: Having that support is always great! So what’s next for you on the tennis scene? What is your schedule like on the tour, and where is “home”? J: I’m continuing to play on the ATP tour and have goals to reach the top of the game. The professional tennis life is quite tough. “Home” is quite a hard word to define for me. I usually tell people my home is my suitcase, but I do feel like Torrance and Taiwan are home for me now. E: Of course I have to ask… what is your favorite Taiwanese food and where do you get it? J: Favorite Taiwanese food would have to be, 粽子. My Grandma makes them!